For special events throughout the year, go to this page for the marketing materials you need. Every March, Special Olympics observes this day to encourage people to pledge not to use the R-word. The R-word Store: Buy T-shirts, branded balls, bracelets, buttons, hats, pins and posters that can be used to promote Spread the Word to End the Word Day. All 2018 Spread the Word Resources: Grab all the 2018 Spread The Word to End The Word resources in a single file package. Get T-shirt patterns, logo, posters, stickers. Includes PDFs and PNGs for easy distribution and Adobe Illustrator files for advanced graphics uses. Facebook Cover Photo I pledged (JPG): These files can be used to promote your Spread the Word to End the Word event. Spread the Word Facebook Cover Version 1 (JPG): These files can be used to promote your Spread the Word to End the Word event. Spread the Word Facebook Cover Version 2 (JPG): These files can be used to promote your Spread the Word to End the Word event. Build A World of Respect T-shirt (PDF): These files can be used to promote your Spread the Word to End the Word event. Pledge to Show Respect to Everyone T-shirt (PDF): These files can be used to promote your Spread the Word to End the Word event. Poster (PDF): These files can be used to promote your Spread the Word to End the Word event. Business Card Front and Back (Illustrator File): These files can be used to promote your Spread the Word to End the Word event. Logo Dated (EPS): These files can be used to promote your Spread the Word to End the Word event. Logo No Date (EPS): This files can be used to promote your Spread the Word to End the Word event. Respect Banner (EPS): These files can be used to promote your Spread the Word to End the Word event. PSA: See the Athlete First: You can use this interesting concept PSA to promote people-first thinking. PSA: Different: This well-loved video is a great one for promoting the joy of Special Olympics. John McGinley: Download this MP4 with a promotional message from actor John McGinley. Fact Sheet (DOCX): These files can be used to promote your Spread the Word to End the Word event. Key Messages and Talking Points (DOCX): These files can be used to promote your Spread the Word to End the Word event. Promote Engagement through Social Media: Here are some powerful social media channels that you can join discussions, subscribe to videos or follow conversations online. Spread the word about the seven honorees for the first-ever Golisano Global Health Leadership Award. Golisano Global Health Leadership Award: List of the 2017 Golisano Global Health Leadership Award Honorees. 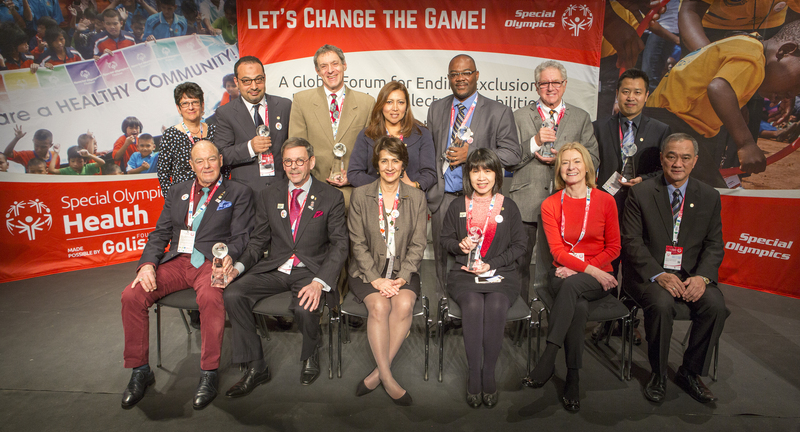 PHOTO: Award winners (JPEG): Full resolution photo of 2017 Golisano Global Health Leadership Award winners. VIDEO: Rajanukul Institute Ministry of Health, Thailand: Rajanukul Institute Ministry of Health, Thailand is one of seven honorees of the 2017 Golisano Global Health Leadership Award. The Institute works in partnership with Special Olympics Thailand. VIDEO: Beijing Tongren Hospital, Capital Medical University: Beijing Tongren Hospital, Capital Medical University is one of seven honorees of the 2017 Golisano Global Health Leadership Award. The hospital works in partnership with Special Olympics China. Template News Release: Tailor this news release to promote your local award recipient. Healthy Communities Map: This map outlines the current Healthy Communities around the world. Award Fact Sheet: This one-pager has more information about the Golisano Global Health Leadership Award. 50th Anniversary Webinar: Explains how we plan to end discrimination toward people with intellectual disabilities. There are two main objectives: raise $100 million dollars and engage 100 million people. 50th Anniversary Presentation 1: Presentation that is associated with the 50th Anniversary webinar. 50th Anniversary Presentation 2: Presentation that is associated with the 50th Anniversary webinar. Campaign Overview: A summary of our needs, the urgency of this campaign, and the 3 pillars that will help us reach out goals. Chicago Celebrations: Outlines the events that will take place in Chicago to celebrate our 50th Anniversary. Leadership Document: Lists our Campaign Co-Chairs, Campaign Committee, Development leadership and our Board Members. Graphics for Eunice Kennedy Shriver Day 2017: Get two 600x600 PNG files, one 600x600 animated GIF, an 820-pixel Facebook cover PNG and a 2412x324 banner PNG for promoting Eunice Kennedy Shriver Day on 20 July. Photos of Eunice Kennedy Shriver: The ZIP file contains 19 photos of Eunice Kennedy Shriver from moments throughout her life with Special Olympics. B-Roll Eunice Kennedy Shriver with athletes at Games elsewhere: Silent clips of Eunice Kennedy Shriver interacting with Special Olympmics athletes at Games and other occasions. This video is 7 minutes long with resolution of 720x480. Eunice Kennedy Shriver Biography - Championing the Cause : A short biography of Eunice Kennedy Shriver and her life, work and passion for helping children and adults with intellectual disabilities reach their full potential. A Revolutionary: Download an audio file about Eunice Kennedy Shriver's impact. Her "Special Friends": Special Olympics founder Eunice Kennedy Shriver talking about the athletes with intellectual disabilities she calls "her special friends." Eunice Kennedy Shriver Day 2017 Toolkit: Get contacts and online resources, activation ideas, social media materials, sample communications materials and background information on Eunice Kennedy Shriver in this 16-page PDF. Eunice Kennedy Shriver Biography: Eunice Kennedy Shriver, founder of Special Olympics, was a pioneer in the worldwide struggle for rights and acceptance for people with intellectual disabilities. Need More Info? : Get more details and answers to your questions by emailing Nikki Villanueva at Special Olympics headquarters.